Our installation refers to the early objects of Croatian mathematician and cybernetician Vladimir Bonačić, who was a prominent member of the New tendencies movement (international network dedicated to the interconnection between art and science, based in Zagreb between 1961 and 1973). According to the artist and theoretician Darko Fritz “Bonačić criticised the use of randomness in computer-based art, as he considers humans to be simply better in “making the ‘aesthetic program’ relevant for human beings”. The critique of randomness, making of ‘aesthetic program’ but also other thoughts of this author inspired us to make a 2D paraphrase of the so called dynamic objects Vladimir Bonačić created in the late 1960s and 1970s. They were kinetic light installations pioneering interactivity in the computer-based art, programmed in a way that the viewer/user could control several parameters (rhythm, sound). 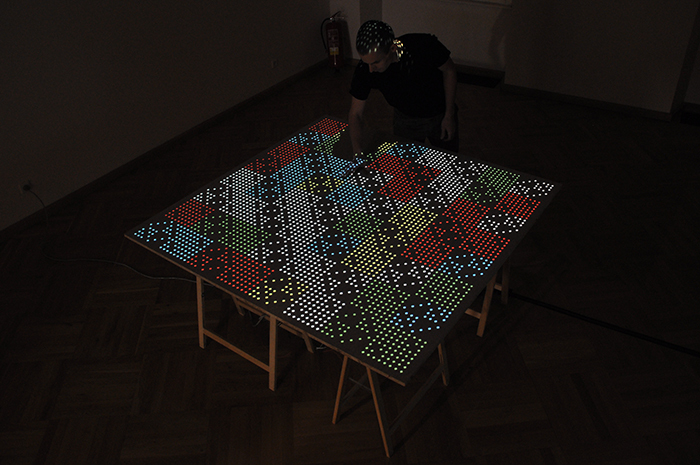 In the installation Hit Bonačić, the viewer can also intervene into the prepared sequence and “program” his/her own code. In contrast to the usually delicate manipulation of technical devices, our installation is controlled by energetic hitting on the table, which enables the visitor to enter his/her own sequence of instructions that create patterns. © 2019 DevKid All Rights Reserved.